In September 2014, Apple released the new iPhone 6 and 6 Plus to rave reviews. In their ongoing quest to make their devices ever thinner, an unexpected problem crept into the design. Within days of release, many users were complaining that their new phones were bending. While Apple conceded that this was happening, they also said that it was “extremely rare”. However, pretty soon, hundreds of customers were posting pictures of their bent phones for the world to see. Fast forward to late 2015, just as the first wave of iPhone 6 and 6 Plus were coming off warranty. The repair community started seeing cases of iPhones that, intermittently, were losing touch functionality. Initially, screen assemblies were replaced and that seemed to solve the problem. However, as time passed, it became clear that something else was going on. At first, the phone will typically develop intermittent touch control failure. For some phones, a gray/white bar starts appearing at the top of the screen. Twisting and applying pressure in certain spots sometimes allows touch control to work for a short period of time, but eventually, the touch interface ceases to function entirely. Today, it is colloquially known as Touch Disease. The aluminum body design of the iPhone 6 and especially the iPhone 6+ has a weak point right near the volume buttons. While some phones have been bent comically out of shape, the sinister reality no one realized is the ever present yet imperceptible flexing of the frame. These micro-flexes occur thousands of times during the lifespan of the device. Coincidentally, the integrated circuits (IC) responsible for Touch functionality are situated at the same level as the volume buttons. 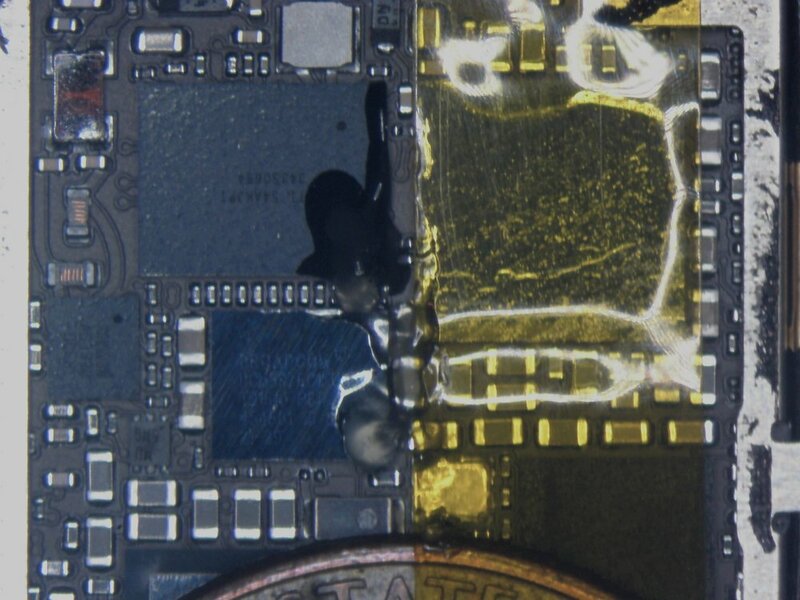 The flexing causes stress on the delicate micro connections (and the associated copper traces and pads)used to secure a modern integrated circuit to a circuit board. These IC’s are in packages known as Ball Grid Array (BGA). There are two IC’s responsible for Touch, one them is commonly known as Cumulus and it is approximately 4mm by 6mm in size and underneath there are 63 tiny little solder balls organized in a grid array. The second IC, known as Meson, is only slightly larger and it has 130 balls. The solder used to secure these connections is environmentally friendly lead-free solder. However it is more brittle than its predecessor, leaded solder. 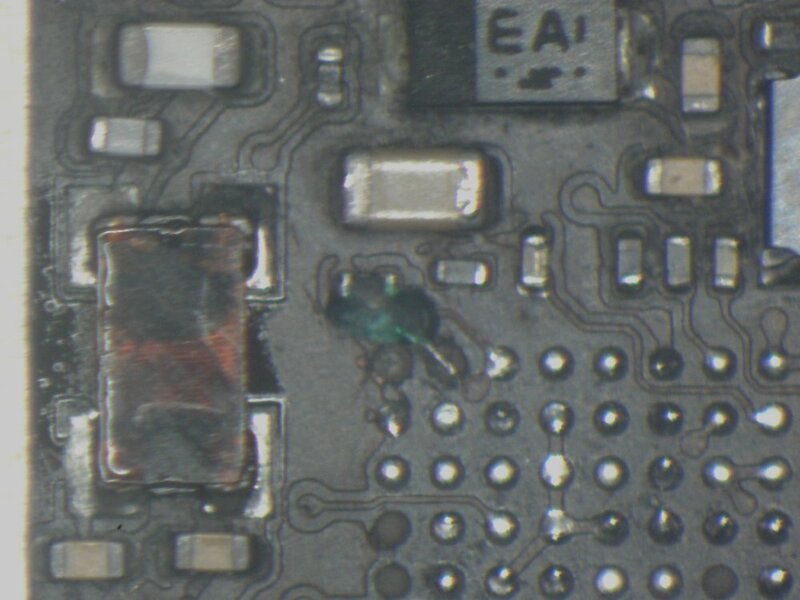 The constant micro-flexing that occurs eventually breaks the soldered connection underneath the IC. This is when users start to see intermittent touch functionality. The copper traces on the logic board are very delicate. Two traces under the Meson IC are prone to cracking right at the junction between the trace and the pad. Of these two, the M1 pad trace seems to be causing the issue of grey bars and lack of Touch. If enough balls start cracking, you will begin to see a gray/white bar at the top of the screen. Eventually, the cracked connections become oxidized to the point where no electrical connection can occur between the IC and the circuit board. That’s when you lose all touch functionality. Is Apple aware of this problem? The frustrating part for iPhone 6/6+ owners is that Apple did not immediately take ownership of this problem. At first they blamed users for bending their phones and when the first touch issues started happening, the Apple Geniuses would not acknowledge the problem and the only solution they offered was an out-of-warranty (OOW) replacement (iPhone 6: $299 USD / iPhone 6+: $329 USD). On November 17th, 2016, Apple finally announced a replacement program for the iPhone 6 Plus only. Depending on your country, you will be charged a lower amount than the regular OOW cost to replace your device ($149 USD). 1. If your phone is under warranty or under AppleCare, go to the Apple store and ask for it to be replaced. They may resist but hold your ground. 2. If your phone is not under warranty and you have an iPhone 6 Plus, you can follow this link and schedule a replacement. For those who own an iPhone 6, Apple will likely only offer you an OOW replacement. 3. Have your device repaired by a qualified repair shop that can do micro-soldering repairs. Keep in mind that if Apple does replace your device; they will give you a refurbished device and only offer you a 90 day warranty. There are more and more reports that even refurbished devices are suffering from Touch Disease. It is also important to remember that unless you have a recent backup of your data, either via iTunes or iCloud, you will lose all of your data and precious photos when you replace your device. If the touch ceased functioning completely, it may be too late to backup your data, as you have to be able to unlock your device if it is password protected. So Apple wants to charge you over $300 dollars to replace your device and you are concerned that the replacement device will likely suffer from the same defect. Or perhaps you don’t have a recent backup of your data and pictures? 1. Removal of Meson IC (removing Cumulus is optional and only done when necessary). 2. Removal of the old lead-free solder from the pads on the circuit board. 3. Tinning of all the pads with fresh solder to insure that there is no oxidation left behind. 4. Installing a micro-jumper (42 AWG enameled wire) on the M1 pad to secure the electrical connection. 5. Installing a new or reballed Meson IC’s (replacing Cumulus is optional and only done when necessary) while applying micro-soldering best practices (proper flux, removal and cleaning). 6. Final cleaning the circuit board to remove all flux residues. 7. Fully test the touch functions throughout the screen surface. 8. Complete a full-function test on the device to insure that all subsystems, such as cameras, microphones and sensors are operational. N.B. Shops that offer to “Reflow” the touch IC’s are not solving the problem long-term. Reflow means that you heat the IC so that the solder becomes molten and will re-flow to create a solid connection. 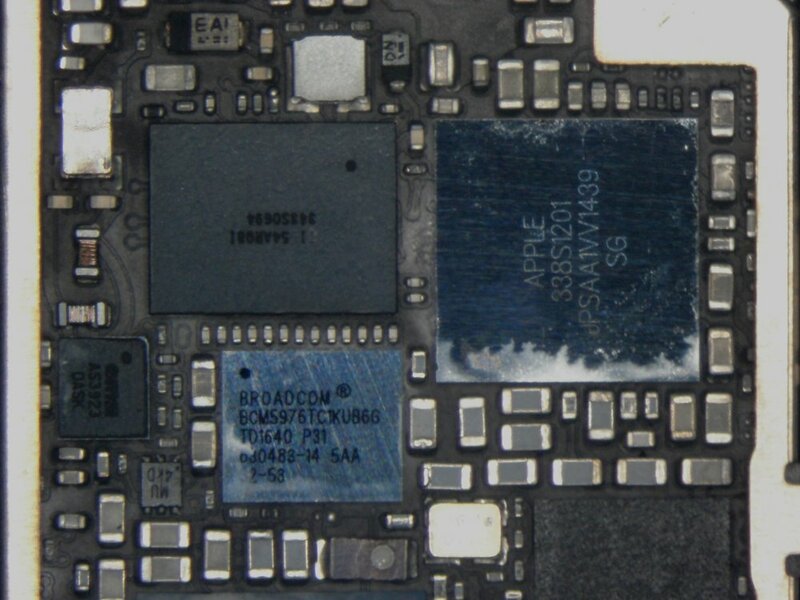 While interesting in theory, if there is severe oxidation or a cracked M1 pad, it will not be solved by reflowing. The only way to know if there is oxidation is to remove the IC’s. Some shops will offer to “Reball” the IC’s. There is nothing inherently wrong with this approach. Reballing means removing the old solder balls on the IC and replacing them with new solder balls. The advantage is that you replace lead-free solder balls with leaded solder balls; this gives you a more pliable connection. The disadvantage is that the longer heat is applied to an IC, the higher the risk of damaging it. At Refectio, we will always install a new IC but sometimes the solder connections are not perfect on the first installation attempt; in those cases we will reball the new IC with leaded solder prior to another installation attempt. Refectio offers a full Touch IC repair service for $129 with a No Fix/No Fee pricing policy. If we cannot fix your device, you will not be charged. We also stand behind our work; we offer a 6-month warranty on our microsoldering repairs. Don’t hesitate to contact us if you would like to learn more or click on the following link to schedule a repair.